Travis and I haven't been resting after we launched a new site revamp a couple weeks back and this evening we are launching a cool new top level feature called Giveaways. Giveaways are game contests that we will be running every now and again any registered Cheerful Ghost user can enter or run. If you see a game you want to win, click to join and you will be entered in the contest to be randomly selected to win! 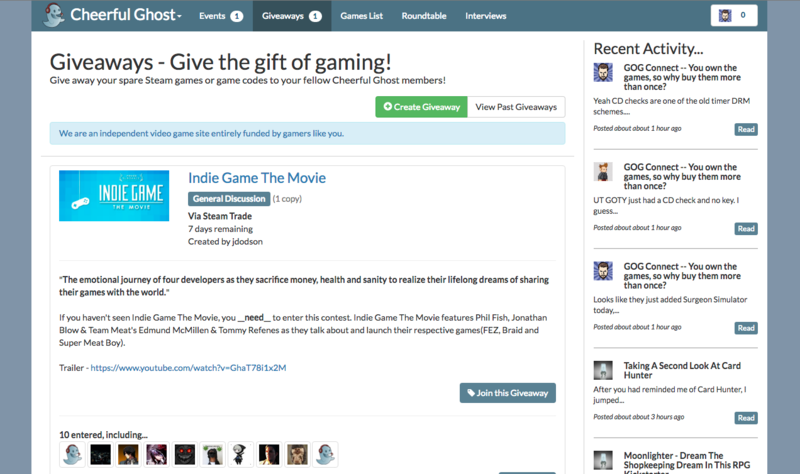 It's also great in that anyone on the site can create a game giveaway for (mostly) and kind of digital game. If you have a few bundle keys or extra copies laying around your Steam inventory you can create a Giveaway contest! Giveaways work in conjunction with another new feature, which is game key gifting. Everyone has had(for a few months now) an option in your drop down menu to manage your game keys. This interface was created for you to add spare Steam, Humble, Origin, Uplay or Itch keys to gift to other Cheerful Ghost users. One nice aspect of key gifting here is that you can see when they opened it and if they haven't opened it in 4 days, you can take it back! When you create a new Giveaway you can select one or many of the keys on your account for the Giveaway OR optionally select that the game is in your personal Steam inventory. When the Giveaway is over we randomly hand out keys to the winners OR if it's a Steam Inventory Giveaway we tell you the winners and you do the game gifting through Steam. Cheerful Ghost has run some amazing game contests over the years starting with our Borderlands 2 giveaway through many now classic titles such as Terraria. I am looking forward to running lots of great Giveaways on the site and i'd also love to see yours too. Travis and I are running two Giveaways right now so head over to the section, check them out and enter! I am running a contest for Sword & Sworcery and Travis is handing out a 3 copies of E.Y.E. Divine Cybermancy. Game Giveaways Are Now Live!